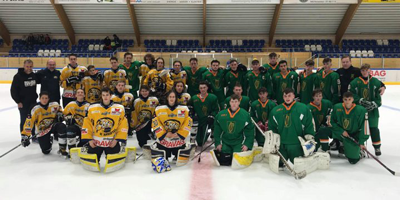 The Irish Ice Hockey Association continues to develop its National teams despite the lack of a single ice rink in the Republic of Ireland. Our Men's Senior team will be taking part in the 2018 Development Cup in Germany later this year, our Ladies team recently competed in a tournament in Latvia, and who can forget our Under 12 National Junior Development Team, The Saints, who were in South Korea earlier this year for a pre-Olympic Games tournament. Next weekend the IIHA sees its Under 11, Under 13 and Under 15 'Saints' travelling to a tournament in Coventry, UK. The continued development and success of Irish ice hockey is guaranteed. Our Men's Under 18 team headed off from Dublin Airport early on Sunday morning (24 June) to Switzerland. The team flew to Munich in Germany, followed by a 3-hour bus journey to Romanshorn in Switzerland. Team Ireland are taking part in 4 games and also have 4 opportunities for training sessions. The training sessions, games and team accommodation are at the amazing EZO Arena in the lovely town of Romanshorn. The facilities in the EZO arena are second to none, with Team Ireland accommodated within the rink. In fact, they can see the ice from their bedrooms. The ice has been described as 'pristine' with at least 12 ice cuts per day. Everything is on-site. Game 1 was against SC Rheintal. The result wasn't what Team Ireland had hoped for and they were well beaten by a strong team. A number of players were playing for Ireland for the very first time and nerves were evident. There was also a degree of rust as some players have not been on the ice for over 4 or 5 months. In the 1st period Team Ireland were dominated, but in the 2nd and 3rd periods they showed a lot more grit and determination. The Team Ireland goal scorers were Thomas Caprenter and David Sally. The team are making the most of the local amenities and are heading to the lake today followed by other facilities nearby. While downtime is important Head Coach Aaron Guli and his Assistant Coach Nigel Smeaton are keeping the team regimented, ensuring that they are as well prepared as possible. An early morning training session greatly helped to loosen up the legs in preparation for tonight's game. This will happen each morning prior to their evening games. Tonight Team Ireland take on the Lakers at 1800 (Irish Time). Stayed tuned for updates on that game.